What state is your wardrobe in? Simplified, organised and minimal or, is it bursting at the seams with all manner of impulse purchases that rarely, (*never* – who are you kidding) get worn? Thankfully, we are coming to the tail end of winter (finally!) and spring is almost in reach. I have seen daffodils in full bloom right here in our village which makes me very happy. And that makes THIS the perfect time to do some wardrobe processing and analysing (perhaps not words you’d usually associate with your clothes?). Here are just a few of the problems you might be encountering if your wardrobe needs some attention. You impulse shop and have all sorts of items that you never wear. Luckily help is at hand. 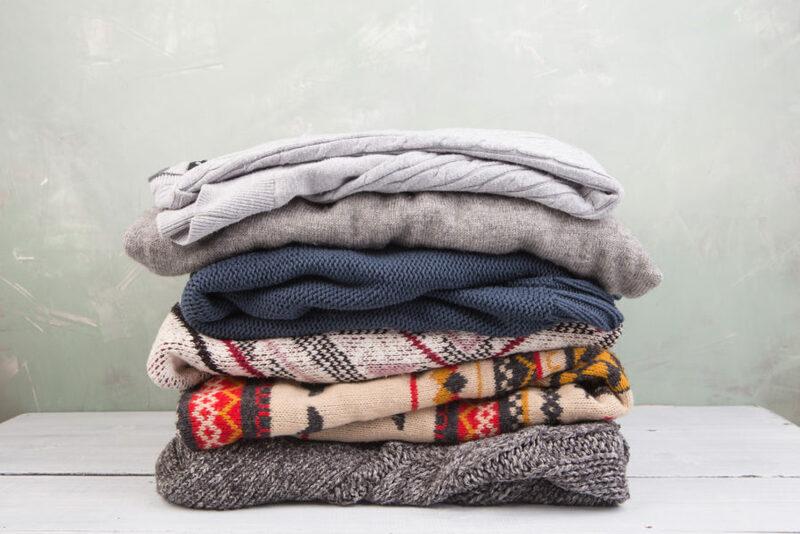 Follow my three-step plan to get your winter wardrobe sorted and working well for you. Save time, money and stress and feel great in your winter outfits. The first step to wardrobe nirvana is to have a quick check through what you have. This is NOT a full-on wardrobe sort out, more a brief stock check. You are likely to see pieces that you haven’t worn in an age that you know you can remove. Do that and take them straight to the charity shop, clothes recycling bank or stick them on a sellers site. Do not leave them in a pile in the corner of your room. Please. The next step is to make a conscious effort to wear everything you have left. An easy way to do this is to start at one end of the rail and work your way along to the end. When you’ve successfully worn something and it is ‘allowed’ to go back in, put it at the back, or behind a ribbon you’ve tied on the rail, so that you can quickly see what is left to wear. The only way to truly know whether to keep something or not is to wear it. Or at least try to wear it. If you can’t make an item of clothing work and choose not to wear it, it’s time to let it go. Unless, that is, you can clearly see that all it needs is a plain black t-shirt* to go with, which is cheap to buy and worth a try before you decide for sure. When you get undressed at the end of the day, spend a moment thinking about whether what you’ve worn was a winner or not. If it kept needing adjusting, wasn’t comfortable or if it didn’t make you feel good, let it go. Step 3: Make a plan for next winter. And finally, start making a list. I do this on my phone so that I don’t lose the list and so that I have access to it when I am out and about. Write down anything you have worn loads and felt good in. Then, when it comes to sale time or when you are thinking about what to buy next winter, you know that more of the same will be a good investment. For me it’s usually loose fit cashmere jumpers. I can never have enough, so when I see them in the sale, I’m all over them. Next, make a list of things you could have done with owning. This is usually something basic such as a pair of black ankle boots, but could be a statement coat. These are things that would have given your outfits more oompf or more of a polished look (if that’s your vibe). It might be that you realise some of your old favourites are way past their best and desperately need replacing. By making a note of them now, you will remember what to hunt out online or in the shops when the cold weather hits again (or you might just pick something up in the tail end of the sales). If you get into the habit of doing this twice a year (or even four times if you are really into it), you will find that your wardrobe becomes massively easier to navigate, more fruitful and might even save you £££ if you are an impulse shopper who wants to reform your ways. Are you going to give this a go? Do leave me a comment and let me know. *insert other basic piece you don’t currently own. I completely agree with your advice Helen. Did this recently to find I had a couple of skirts with no tops as they had worn out. It meant a shopping spree with a specific goal in mind. Fortunately all your advice was written down so I knew what to look for.